The same routine worked well once again– Broken Wing as decoy, and this time the sibs even beat us down to the wash and were sitting there waiting (I daresay their pattern recognition skills exceed those of most of our neighbors). Broken Wing apparently has a favorite seat down there; he headed right for this elevated tussock and hunkered right down– until he noticed the one last scrap of elk that I was saving for bait to lure the others over. He hopped from about 20′ away and was just about to nab it (pretty good eyesight to spot the small red morsel among the black, blue, and green objects!) when I spotted what he was up to. Two minutes later, Never and More had joined the party, and were swilling away at the water dish and getting cozy in the elm’s shade. Not a bad setup. I was talking with Shawn this morning and he said he’d gotten a ‘call’ (i.e. complaint) about the birds. I explained that we were doing our all to rehab and wildify them, and were making good progress. This relieved him– he’d done his job and told us, and now he was off the hook. More flyovers from the resident birds, and (so far) no sign of hostilities, just curiosity. Never and More flew several hundred yards uninterrupted on their way to the wash, and actually landed about fifty yards from the big nest tree– which had several birds sitting in it– and spent five or ten minutes just wandering around there, so I think they’re getting a handle on the raven geography of the area. 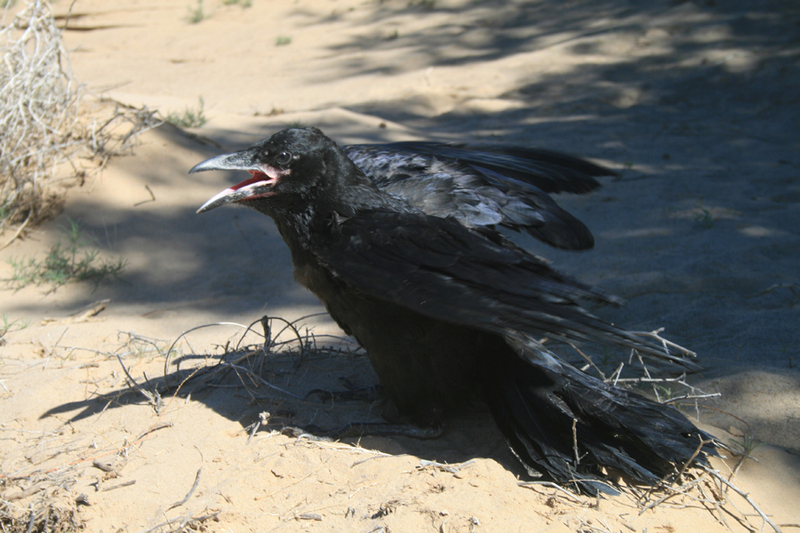 This entry was posted in Beings, Ravens and tagged Hopi, Kerry Hardy, Ravens, reintroduction, wild by Andrew Lewis. Bookmark the permalink.